For those encountering Émile Goué for the first time, he was born in Chateauroux, central France, on 13th June 1904. Highly intelligent, he combined music with a brilliant scientific and academic career. Toulouse Conservatory provided his initial musical grounding but later in Paris he came under the influence of Albert Roussel and Charles Koechlin. He married Yvonne Burg in 1927 and became the father of three children. Although his earliest compositional ventures date from 1933, it was 1936 that saw the burgeoning of an intense period of creativity and he destroyed much of his earlier work. The war intervened, and in 1939 he was enlisted as a lieutenant of artillery. In June 1940 he was captured and spent the next five years as a prisoner of war in Oflag XB Nienburg-on-Wesser. He died not long after his release on 10 October 1946, a broken man. In his earliest extant works, Debussy and Koechlin seem to be discernible influences. During his period of incarceration, his own unique voice slowly began to emerge. It’s amazing that these dreadful and difficult years in no way stunted his creative processes, but on the contrary enabled them to flower. 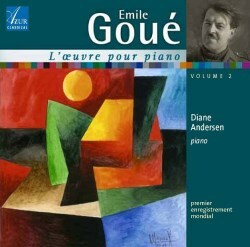 The main bulk of his piano oeuvre dates from this fruitful period. I should point out two characteristic features. He frequently builds his music up from a single theme which is later developed, and he has a masterful command of counterpoint. The earliest work Pénombres of 1931 evokes half-light and it's three sections are awash with impressionistic shades, strongly reminiscent of Debussy. The other work from the same year is the three-movement Sonata, very much tinged with a neo-classical flavour. Classically cast in a fast, slow, fast mould, the slow movement is particularly attractive, it's chordal nature kindling both mystery and solemnity. The work concludes with an animated finale. By the time Goué came to write the three pieces which make up Ambiances Suite No. 2 in 1942, he was firmly ensconced in Oflag XB and his compositions had become more personal and original. The music is more harmonically complex. The first piece Orage, for instance, is noticeably more dissonant than what went before, and although Fleur morte which follows is more serene, there is, nevertheless, an underlying tension. Prélude, Aria et Finale, op. 45 of 1944 is exceptionally fine and displays a high level of maturity and vision. A year later, Goué composed the Thème et variations, which consists of a fairly sombre theme followed by eight variations. He packs much into this work of just over seven minutes duration, with each variation becoming progressively more complex and elaborate. Diane Andersen's idiomatic performances have great appeal and are aided by a well-recorded piano and a sympathetic acoustic. It has been gratifying to encounter this rarely performed music.